Allie had her dental surgery yesterday. Not sure why but I thought this procedure was going to be a breeze for her. I guess I didn't anticipate how scared she would be and how much pain she could have aftwerwards. Surgery itself went great - it was the before and after that was so hard. Allie freaked out when the nurse tried to take her back to surgery - it was awful. Matt and I were both in tears. Allie had received the verset medicine but apparently it didn't work this time. She screamed all the way back to the operating room - yes, we could hear her! Surgery took about an hour. I guess it takes a while to get the caps fitted and put in place over her teeth. Allie's gums were growing around the back side of her teeth so they also had to grind down the gums all around her mouth - this would insure a good fit for the caps. Of course she woke up from anethsia kicking and screaming but this was like nothing Matt and I ever seen before. Allie was completely inconsolable. She was crying out, "mom, help me". It was awful. But, we managed and she's fine. We left the hospital about 15 minutes after surgery. Record time for getting out of there no doubt - I personally think the nurses (and staff) just wanted us gone because Allie was being so loud with her kicking and screaming. If she was much bigger, I don't think I would have been able to even hang onto her. Once we left the hospital, she calmed down and she was clonked out. We didn't even put her in her car seat, I just held her in the backseat on the way home. I slept with her for about 2 hours in her bed and when she woke up, she was happy. Her mouth is a little sore but we are continuing with tylenol and motrin. Out of everything, she says her throat hurts the most. It's probably from being incubated - not sure. But she is handling the pain very well - she is even eating a little bit. Glad this procedure is over and like I said, I totally under estimated this. I guess I was thinking a dental procedure wouldn't be too difficult, however I was wrong. This was awful for Allie. Her mouth was bleeding like crazy, she swalled a lot of blood during surgery (we vented her stomach with her tube after surgery and she vented out a ton of blood). Her recovery seems to be quick though - it's 24 hours since surgery and she's almost back to her normal self. Thank you to everyone for keeping her in your prayers. We truly appreciate it. In addition to Allie's surgery, our dog Cosmo was sick yesterday too. She was scheduled to be spayed but woke up not being able to walk on her front leg. I took her to the vet and she was diagnosed with lymes and anaplomosis. It can be very serious but it seems we caught it early and she's doing good now. She's on pain medication and antibiotics to keep her comfortable. Here are a couple pictures and video of Allie's surgery from yesterday. Allie had a regular dentist checkup last week and we didn't get the results we were hoping for. Like many things with Allie, we are learning as we trudge forward with her medical issues. Allie was born with enamel hypoplasia, basically born with no enamel on her teeth. This makes her teeth very prone to cavities and other issues. Allies dentist has been great and we have been watching her teeth closely for a while now. 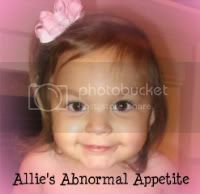 In addition, Allie's oral development is delayed - not just in eating but in her teeth development as well. Allies back molars came in but her gums never receded, therefore they are very close to her molars. This is a prime spot for food to get stuck and it's almost impossible to get out. All of Allies 4 back molars are severely affected by this along with the fact that they have no enamel on them. Allie's back teeth are decaying and we need to do something about it even though they are baby teeth. She will keep these 4 molars until approximately age 12. The only way to save these teeth is to cap them. She will have 4 metal caps put on her teeth this coming Wednesday. Due to Allies medical history and her fear of procedures, surgery, needles and everything else associated with doctors, her dentist requires us to have this procedure done at the hospital under full anesthesia. Allie goes to her Pediatrician on Monday for a check-up to make sure she is well enough for surgery and then on Wednesday, Allie will have the caps put on her teeth at the hospital. Allie will be sore after surgery because they have to grind down her gums in the back by all 4 of her teeth. In addition, her dentist said that having the metal caps will change her bite and it will feel like she has marbles in her mouth. So, it's going to be uncomfortable no doubt but I am thankful for her feeding tube in case we have any issues with her not being able to eat even small amounts. This is not a major surgery but just the fact that she has to have this procedure done at the hospital and that I have to hand my baby over to the doctors AGAIN for her to be under full anesthesia, is scary. As many of us know and experience, it never gets easier handing over your child to the doctors - if anything, it gets worse. 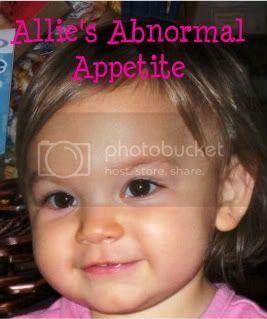 Allie is now 4 years old and knows what is happening - she's been through surgeries before and she knows what to expect. I'm positive everything will go smoothly and we will get past this hurdle with no major issues, but please keep little Allie in your prayers next week as she goes through this. She is one tough little girl!